Classic Flat Athletic Laces for Chucks, Group 1. Lace up your chucks in style with these made in USA classic tubular shoelaces that closely match the shoelaces originally issued with chucks. 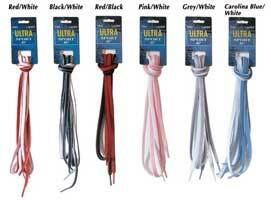 Our best quality single color flat athletic shoelaces are 3/8 inches wide and 54 inches long. The laces are meant for standard size high top chucks or large shoe size low cuts with eight eyelet pairs. Classic flat athletic laces come in twenty-eight basic and neon colors. Natural is for unbleached white chucks. Grey is the metal grey tint. Light grey is available in a flat ribbed model only. To see how white, black, red, navy blue, metal grey, royal blue and natural shoelaces look on various pairs of chucks, go to the Classics 1 Shoelaces for Chucks Gallery. Classic Flat Athletic Laces for Chucks, Group 2. This section features seven additional colors of our best quality single color flat athletic shoelaces. Gold is a bright gold. To see how orange, purple, Kelly green, hunter green, sky blue (often called Columbia blue), gold, and rust shoelaces look on various pairs of chucks, go to the Classics 2 Shoelaces for Chucks Gallery. Classic Flat Athletic Laces for Chucks, Group 3. This section features another eight colors of our best quality single color flat athletic shoelaces. Pink is the traditional pink. For neon pink, see below. Burgundy is also known as maroon. Yellow is a lemon yellow shade. To see how brown, pink, tan, burgundy, yellow, and teal shoelaces look on various pairs of chucks, go to the Classics 3 Shoelaces for Chucks Gallery. Classic Neon Flat Athletic Laces for Chucks. These extra bright single color flat athletic shoelaces come in four neon colors. To see how neon lime, neon orange, neon pink, or neon yellow shoelaces look on various pairs of chucks, go to the Neon Classic Shoelaces for Chucks Gallery. Flat Ribbed Laces for Chucks. These shoelaces are made from a flat ribbed single strip of braid. These single color flat athletic shoelaces are 3/8 inches wide and 54 inches long. The laces are meant for standard size high top chucks or large shoe size low cuts with eight eyelet pairs. For additional color selection see the classic 54 inch shoelace items above. Add 54 Inch Light Gray to Cart. Add 54 Inch Royal Blue to Cart. Add 54 Inch Sky Blue to Cart. Add 54 Inch Yellow to Cart. Add 54 Inch Neon Pink to Cart. Add 54 Inch Neon Lime to Cart. Flat ribbed shoelaces, reversible shoelaces in six color combinations. These shoelaces come in two colors, one on each side so you can lace up in two colors or one basic color with trim. Six cool color combinations are available. 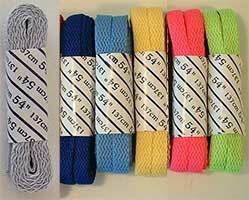 These 54 inch shoelaces are meant for Chuck Taylor eight eyelet pair shoes. To see how red/white, black/white, black/red, pink/white, grey/white, or Carolina blue/white reversible shoelaces look on various pairs of chucks, go to the Reversible Shoelaces for Chucks Gallery. Add 54 Inch Red/White to Cart. Add 54 Inch Black/White to Cart. Add 54 Inch Black/Red to Cart. Add 54 Inch Pink/White to Cart. Add 54 Inch Grey/White to Cart. Add 54 Inch Carolina Blue/White to Cart. Purchase chucks, shoelaces, clothing and books about chucks.